Cheap calling is the hallmark of VoIP. Business VoIP service providers charge about 2 cents per minute in the United States and Canada. Alternately, business VoIP providers offer unlimited calling for between $20 and $40 per user. International calling is also cheaper, and while the cost of minutes vary between providers and among different countries, the prices are uniformly lower than calls from traditional phone providers. Calls within a VoIP network are free, even across the world. You can call another office or your warehouse as easily as you can dial an extension to dial across the hall. With VoIP, you can make cheap calls from anywhere, to anywhere, without having to pay expensive roaming charges, by connecting your smartphone, tablet, or laptop, to your VoIP provider over a Wi-Fi hotspot or wired connection. There are two main reasons why VoIP is so much cheaper than traditional phone services. The first is technological. Traditional phone calls are transmitted over the public switched telephone network, or PSTN. The two ends of the call must be connected to each other the entire time, even though half the time one end is silent as one party talks and the other listens. With VoIP, computer algorithms called codecs encode and compress your voice, in a manner similar to the way your favorite MP3 player encodes and compresses music. The data is then sent in packets, much like email. The second reason is competition. There are only a few large phone companies, and they have little incentive to innovate or keep prices low. There are hundreds of business VoIP providers vying for your business, and new ones being started every day. Top VoIP providers must innovate and keep prices low or their customers will take their business elsewhere. Compared to traditional PBX systems, VoIP telephony systems are much easier and cheaper to install. Everything traditional PBX systems can do on-premise is instead done by computer hardware that is hosted by your VoIP provider. You get all the benefits without expensive installation costs, or long term maintenance contracts. All you have to do to is get an IP phone and plug it into your Internet jack. If you don’t have an extra Internet jack, you can plug your computer into your IP phone and your IP phone into the jack, and the phone will pass the data through. If you have an IT staff, they will have a much easier time programming the new phones, as well as adding and moving employees. If your company is too small to have its own IT department, it will be easy for you to learn how to use the features of your new VoIP system because each VoIP provider has an intuitive graphical user interface to let you program how calls are routed. One of the remarkable features that comes standard an all business VoIP plans, even the ones designed for sole proprietors, is the ability to route calls to different phones. Call routing is an advanced version of call forwarding that enables you to ring several phones, either in sequence or at once. This is great for sole proprietors because you can give out one number for work and another for personal calls, and you don’t need to carry more than one phone with you. You can take things a step further with advanced call routing rules and privacy rules. 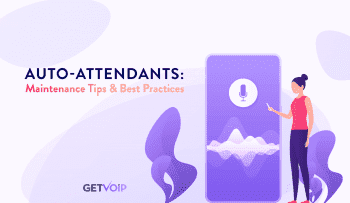 You can manually, or depending on the time of day and the caller, set calls to go to specified phones–such as your cell phone, your home phone, or your colleague’s phone—or be directed straight to voicemail. 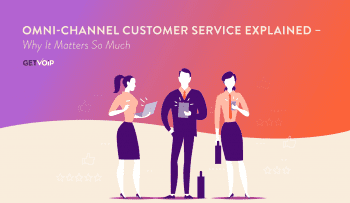 You can tailor these rules so specifically that when an important client or your sweetie need to reach you, you can always be available, but maintain normal business calling rules for everyone else. One of the major concerns that businesses face when upgrading to VoIP is whether the sound quality and service will be as high as your old system. Ten years ago, these were legitimate concerns, but today, VoIP business solutions are better than their 20th century competition. The numbers, quite simply, don’t lie. Telephone companies promise 99.9% reliability. Business VoIP service providers promise 99.9%, 99.99%, or even 99.999% reliability. VoIP is unaffected by inclement weather, and bounces back faster if there is a problem. The numbers also don’t lie when it comes to sound quality. Phone calls carried on the PSTN have a bit rate of about half that of an MP3. VoIP calls can now sound as good as stereo CDs. VoIP solutions are customized to the needs of each client. Whether you are a call center, a multi-faceted business with many different departments and specialists, or a business that does a high number of online meetings and webinars, hosted VoIP includes many features you need standard, or as an affordable add-on. VoIP phones and VoIP software is designed to work anywhere, whether your office is a local coffee shop or if it’s on the top floor of the Empire State Building. Employees who telecommute can use the same software, and even have the same extensions and outgoing phone number as office employees. You can also take your IP phone with you and plug it in to your router to get work done from home. A big trend is “Bring Your Own Device,” or “BYOD,” where employees bring their own smartphone, tablet, or home laptop, and install software on those devices that let them work anywhere. The key feature of BYOD, from the perspective of the VoIP service provider, is that these applications work on any device, whether it’s an iOS device from Apple, an Android device from Google, or even a BlackBerry, Nokia, Windows Phone, or any of the less popular platforms. As it stands right now, most business VoIP service providers’ apps work on iPhones and Android Phones, but you should check if a particular provider is compatible with your device of choice. 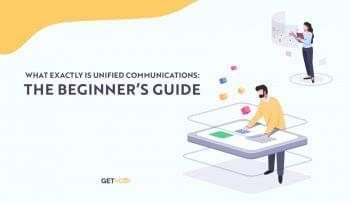 Unified Communications and Collaboration, sometimes called UC or UCC, is quickly becoming a buzzword in the business world. It’s easier than ever to combine discrete technologies and platforms like Skype, email, phone, and fax into one program. Connect your Facebook, Yahoo, and AOL list into one chat. Click an email and call the person that sent it to you. Receive a phone call and have a screen pop up with the caller’s last outstanding bill. With Voice over Internet Protocol, you, and your employees, will have all the tools you need to get the most out of your busy workweek. With VoIP, there have never been so many ways for new customers to get in touch with you. Anywhere that a VoIP provider has a presence, you, the subscriber, have the option of choosing a phone number in that area code. You can keep your number, or get a new one. VoIP providers also provide toll free numbers, with 800 prefixes, and newer toll free prefixes, including 888, 877, 866, and now 855. Your company will look great with a creative vanity number that is easy for prospective clients to remember, and inexpensive for you. A vanity or toll free number gives your business gravitas. Another service that VoIP providers offer is a virtual number. A virtual number is a number in any area code that forwards to your main number automatically. You can even have international numbers. With a virtual number, you can “open a new office” by simply adding another virtual number to your plan. Skype is a wonderful tool for personal video chat. But, for business you need a service that means business. VoIP video and audio conferencing tools have higher sound and video quality, making it easier to distinguish between different voices, leading to less ear-strain. 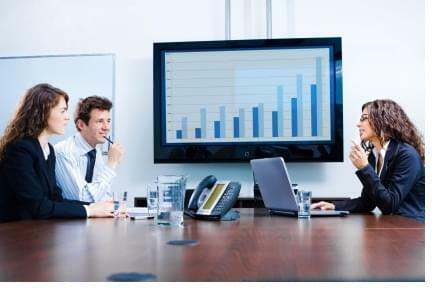 Video conferencing technology makes huge leaps with VoIP. As if it weren’t enough to have high definition picture, new VoIP videoconferencing cameras pan and zoom on the speaker based on the sound of his or her voice. Another type of audio conference software uses your computer screen to indicate who is speaking by lighting up their avatar. There is no one best kind of video or audio conference tool, only the ones that work best for you. But, none of them would be possible, let alone affordable, without Voice over Internet Protocol.